He was born in Cremona in 1968. Under the teaching of Masters Bergonzi, Negroni and Scarpini, he graduated from the International School of Violin-Making in 1986. Working in the workshops of Masters Nolli and Scolari, he perfected his personal style and enriched his experience in the construction, varnishing, acoustical sound and restoration of bowed instruments of the classical quartet. Since 1990 he has been a professional violin-maker, inspired by great violin-makers of the Cremonese tradition. He collaborated with Maestro Massimo Negroni in the study and research of various types of spirit and oil varnishes with a lot of new experimentations. In 1991 he started to participate in various national and international competitions with great success: in 1993 he won the gold plaque offered by A.L.I. 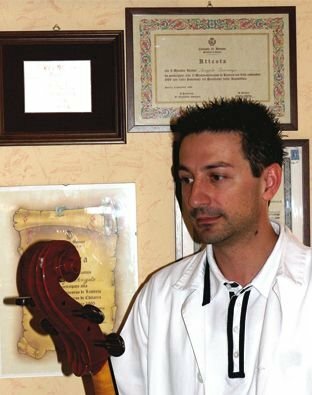 (the Association of Italian Violin Makers) in Baveno; in 1997 his cello arrived 7th at the Triennial Competition for Bowed Instruments in Cremona; In 1994 he was among the finalists in the A.V.S. competition in Oakland (USA) with a violin; and in the same competition held in Albuquerque in 1996 he won two Certificates of Merit for the best work in the cello and the quartet sections. Since 1998 he has been teaching practical workshop, varnishing, sound acoustics and bowed instruments setting up at the International School in Cremona. His instruments are inspired by the Italian tradition of the late 19th and early 20th centuries. He also builds copies of instruments of important violin-makers of the 18th century such as Guarneri del Gesù, Domenico Montagnana, Oddone, Fagnola, Amati and Goffriller.